For the mathematics journal, see Discrete Mathematics (journal). 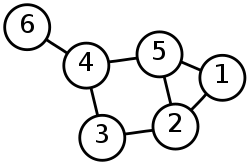 Graphs like this are among the objects studied by discrete mathematics, for their interesting mathematical properties, their usefulness as models of real-world problems, and their importance in developing computer algorithms. Discrete mathematics is the study of mathematical structures that are discrete rather than continuous. In contrast to real numbers that vary "smoothly", discrete mathematics studies objects such as integers, graphs, and statements in logic. These objects do not vary smoothly, but have distinct, separated values. Discrete mathematics therefore excludes topics in "continuous mathematics" such as calculus and analysis. Discrete objects can often be counted using integers. Mathematicians say that this is the branch of mathematics dealing with countable sets (sets that have the same cardinality as subsets of the natural numbers, including rational numbers but not real numbers). However, there is no exact, universally agreed, definition of the term "discrete mathematics." Many times, discrete mathematics is described less by what is included than by what is excluded: continuously varying quantities and related notions. Research in discrete mathematics increased in the latter half of the twentieth century partly due to the development of digital computers which operate in discrete steps and store data in discrete bits. Concepts and notations from discrete mathematics are useful in studying and describing objects and problems in branches of computer science, such as computer algorithms, programming languages, cryptography, automated theorem proving, and software development. In turn, computer implementations are significant in applying ideas from discrete mathematics to real-world problems, such as in operations research. ↑ Richard Johnsonbaugh, Discrete Mathematics, Prentice Hall, 2008. ↑ Weisstein, Eric W., "Discrete mathematics" from MathWorld. ↑ Norman L. Biggs, Discrete mathematics, Oxford University Press, 2002. ↑ Brian Hopkins, Resources for Teaching Discrete Mathematics, Mathematical Association of America, 2008. Norman L. Biggs, Discrete Mathematics 2nd ed. Oxford University Press. ISBN 0-19-850717-8, and companion web site including questions together with solutions. Donald E. Knuth, The Art of Computer Programming ISBN 978-0321751041. Richard Johnsonbaugh, Discrete Mathematics 6th ed. Macmillan. ISBN 0-13-045803-1, and companion web site. John Dwyer & Suzy Jagger, Discrete Mathematics for Business & Computing, 1st ed. 2010 ISBN 978-1907934001. Kenneth H. Rosen, Discrete Mathematics and Its Applications 6th ed. McGraw Hill. ISBN 0-07-288008-2, and companion web site. Jiří Matoušek & Jaroslav Nešetřil, Invitation to Discrete Mathematics, OUP, ISBN 978-0198502081. Mathematics Archives, Discrete Mathematics links to syllabi, tutorials, programs, etc.